salty sweet is where it’s AT! This is like chocolate covered pretzels KICKED up a big notch! 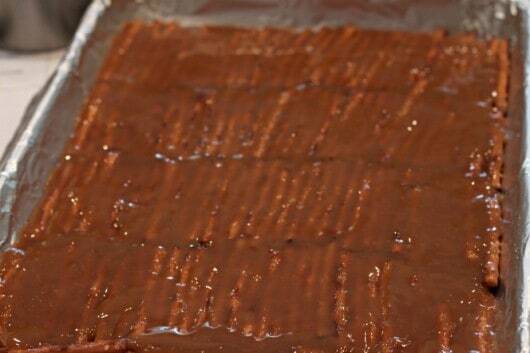 This toffee is easy to make and believe me it does not disappoint. It’s salty sweet crunchy and smooth all at once, how is that possible? Who cares how it’s possible, I’m just SO glad it is. 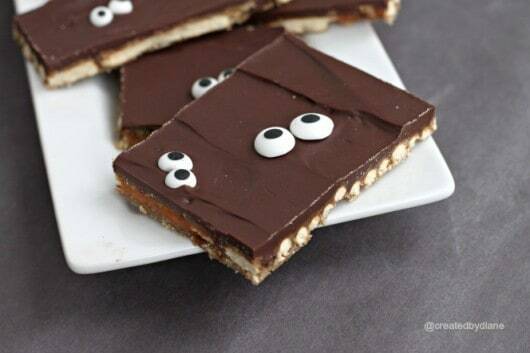 This toffee is topped with these cute GOOGLE EYES, click the link for how to instructions. 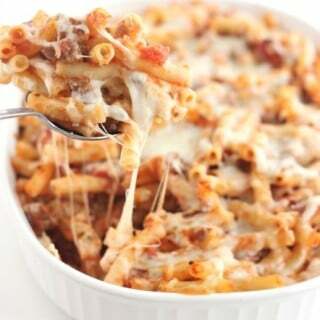 This tray was gone WAY to fast, so feel free to double the recipe….I’m wishing I did. 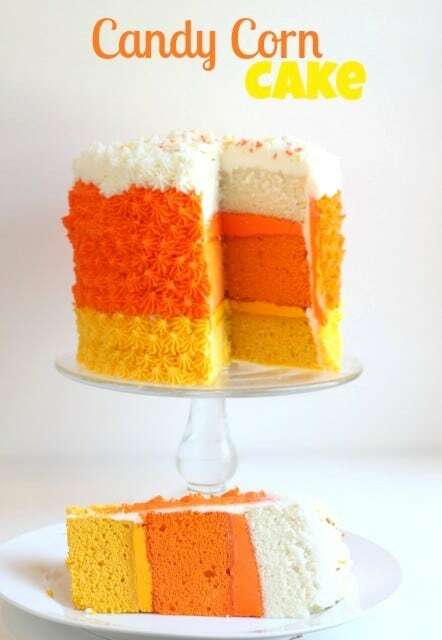 This is one of those go to items, if you are invited at the last minute you can whip up a batch of this pretty quick! place chocolate chips on top, the heat of the toffee will melt the chocolate and make it easy to spread smooth. 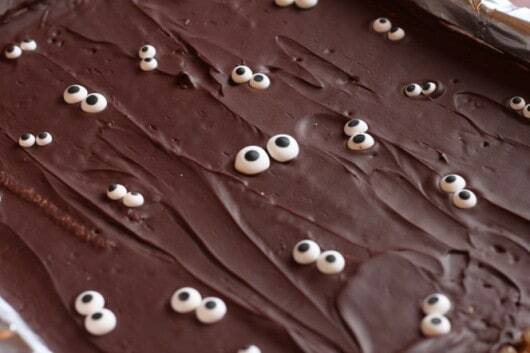 Place the googly eyes on top of the chocolate and then place it in the refrigerator to set up the chocolate. Place pretzels on baking sheet. In saucepan heat butter and sugar and boil for three minutes. Pour the heated toffee over the pretzels. Take pan out of oven. Place chocolate chips on top of toffee, wait 1 minute. Spread with offset spatula. 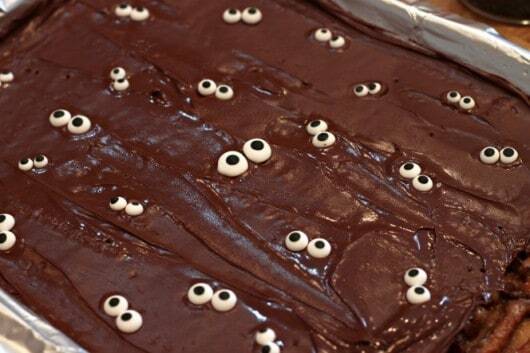 Place Googly eyes on top and place baking sheet in refrigerator to set up for 30 minutes. Cut apart with knife or break into pieces. Cut up the toffee and ENJOY it! 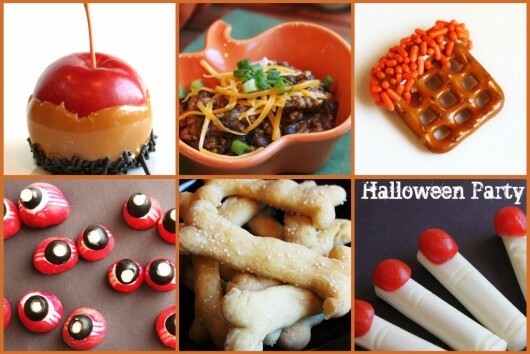 Pumpkin Jalapeño Chili and other fun party ideas. 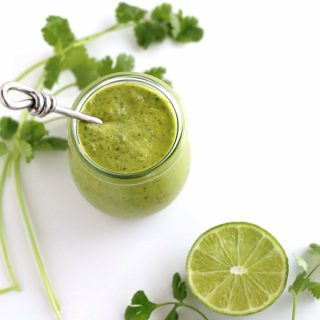 So simple and simply adorable! I love sweet and salty together. 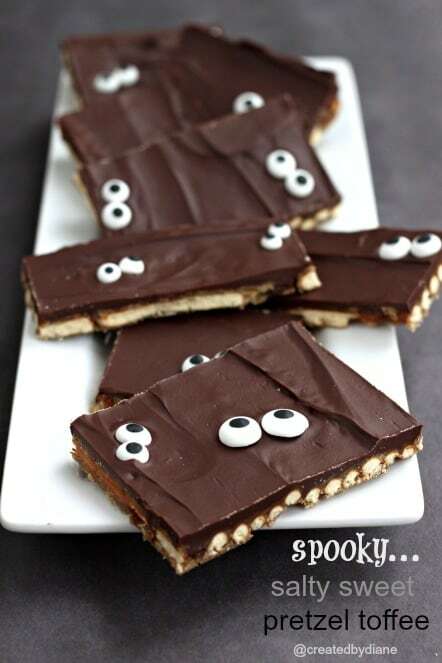 Those homemade googly eyes make those treats so much fun. I don’t know if I’d ever have the patience to make them, but I love how they came out!! They make a great, festive touch to the toffee. I am such a freak for sweet and salty right now! 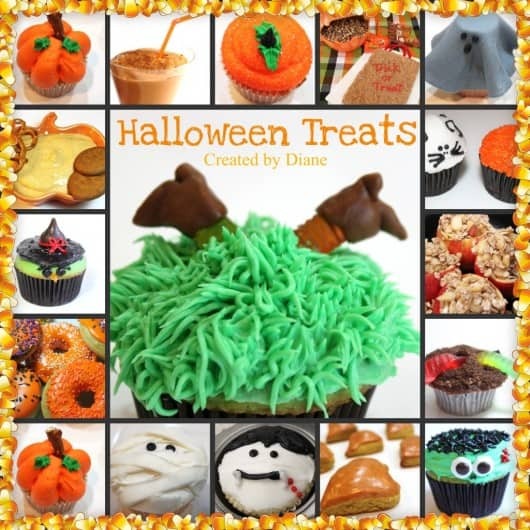 This is such a fun recipe and I love those eyes!!! HA! Super cute! Also, I’m not sure these would ever leave my house. 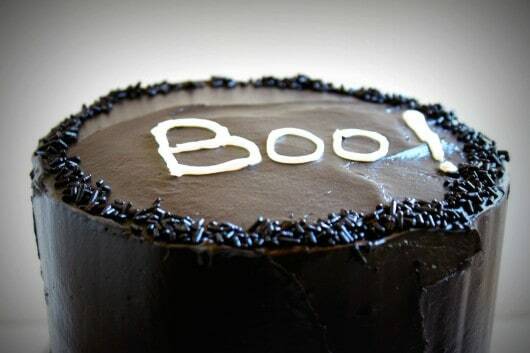 I would just eat the whole batch. What is a 1/4 sheet pan? Is it the size of a jelly role pan (which is large) or a 9 x 13 cake pan or a cookie sheet? The little googly eyes are so cute! What a fun (and funny) idea Diane!